In between rounds of hole digging for the new trees I also somehow managed to put together the veggie patch and get some food started this past spring. At this point, I have already pulled the dead and bolting stuff out of the veggie patch twice and just planted another round of lettuces and spinach. 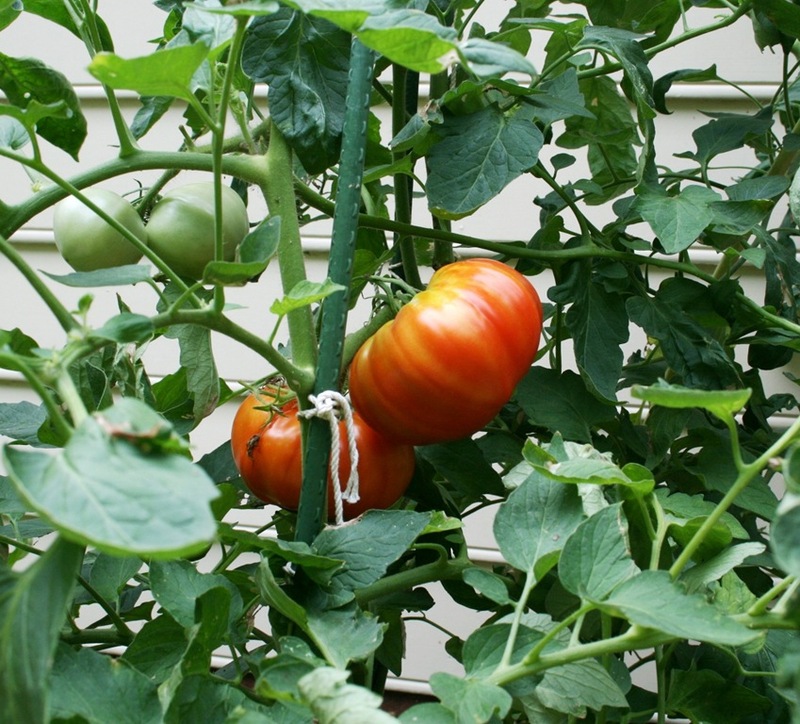 I tried to give the tomatoes another week, but they just hung there looking more and more unattractive as their leaves curled up and started to die. Plus, the fruit was staying green and not really getting any larger, so earlier this week I yanked them out of their cozy little beds and sent them packing. We had an abundance of tomatoes this summer that we enjoyed immensely. My only regret is not planting more so I could make sauce for the winter. 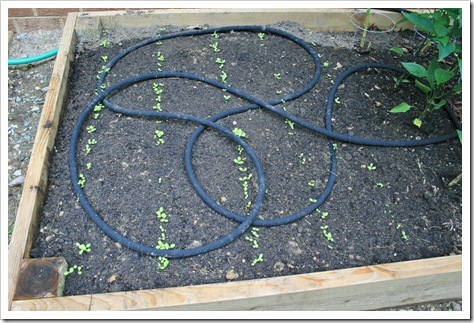 This is something I plan to remedy next spring with a garden expansion- hopefully! 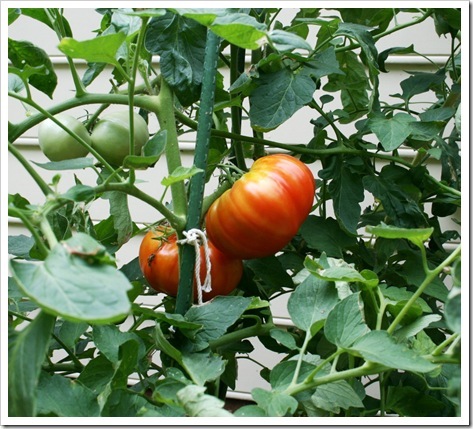 A couple of Best Boys ripening on the vine earlier this summer. By the way, I planted three Supersonics and a Best Boy this year. They grew in a very upright pattern and produced a LOT of fruit. So much so, that one plant got really heavy and slid down the stake, breaking under the weight. I employed my usual method of staking and pinching off the suckers as they came up, taking only one additional step of actually pruning away branches around the bottom of the plants, to allow for more airflow, and cutting back those that were really blocking the progress of their neighboring plant. The process seemed to work very well and I believe if we commit an entire raised bed just to tomato plants we will have plenty of sauce for a fully stocked pantry by next September. I had never grown these varieties before and was pleasantly surprised with the results. Hopefully Lowe’s will run another 2 for a $1.00 deal on tomatoes next year as well. Wow, I just realized that we enjoyed cream of the crop slicing tomatoes all summer for $2.00! cool. 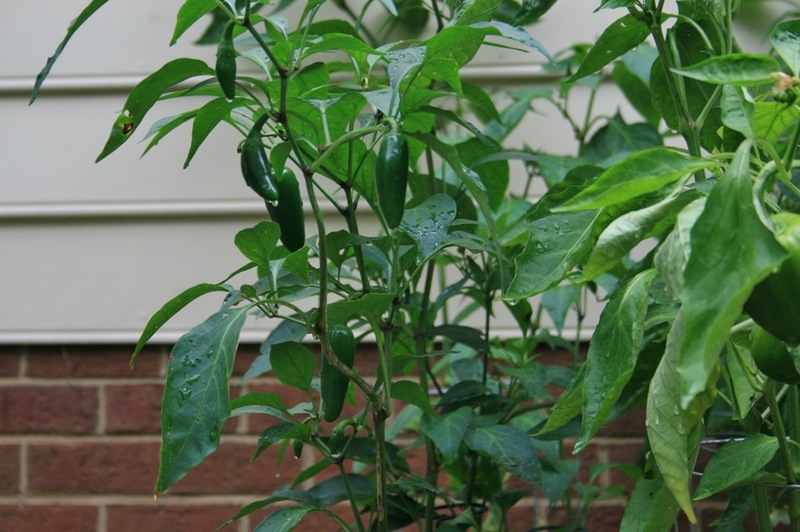 Right now, I am hoping our jalapenos and couple of bell pepper plants hold on long enough to finish what they have started, which is just a little too small to pick yet. 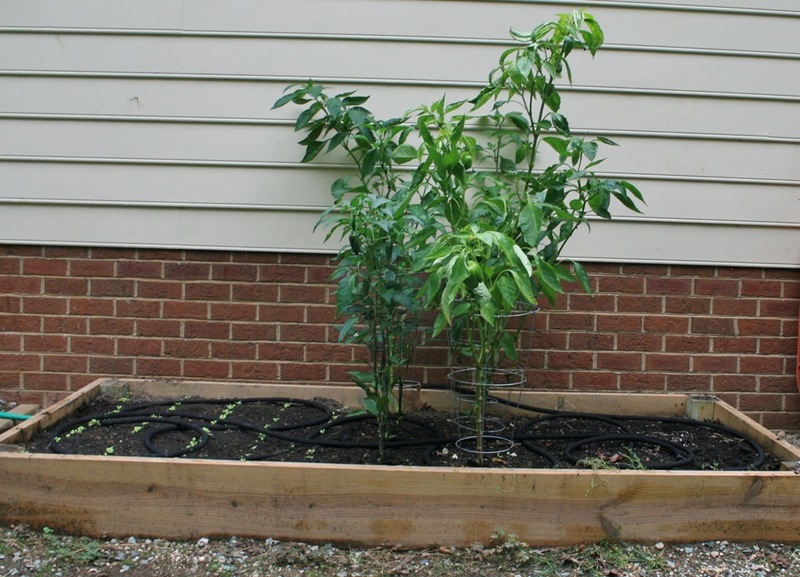 This shot makes me giggle because the pepper plants look so funny being the only large, upright things in this garden bed right now. The lettuce is coming in nicely to the left, though! The herbs I left in the ground are still going crazy and while the strawberries are continuing to grow, they are not doing anything more than staying green. 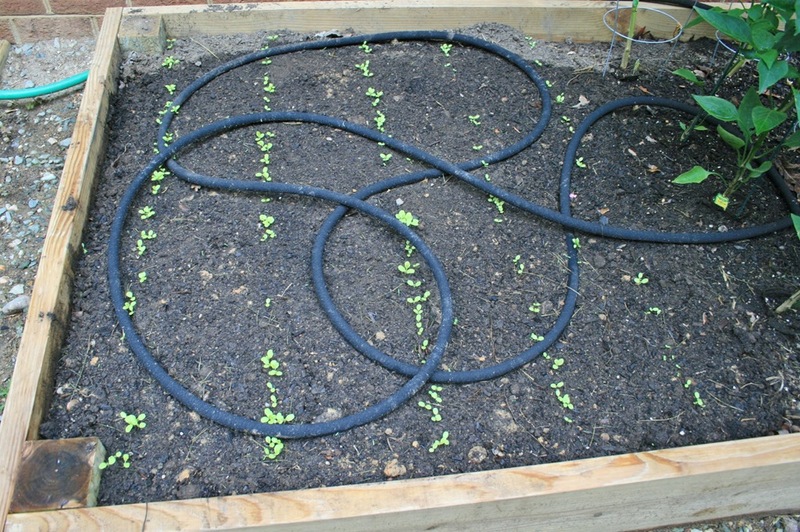 In the cleared areas of the beds I sowed some more lettuces and spinach, which have already started to sprout. If all goes well we should have more leafy green stuff than we can stand to eat in just a couple more weeks. With this last attempt at outdoor gardening completed I am now shifting my focus to an indoor herb garden and some herb decorating for the fall. 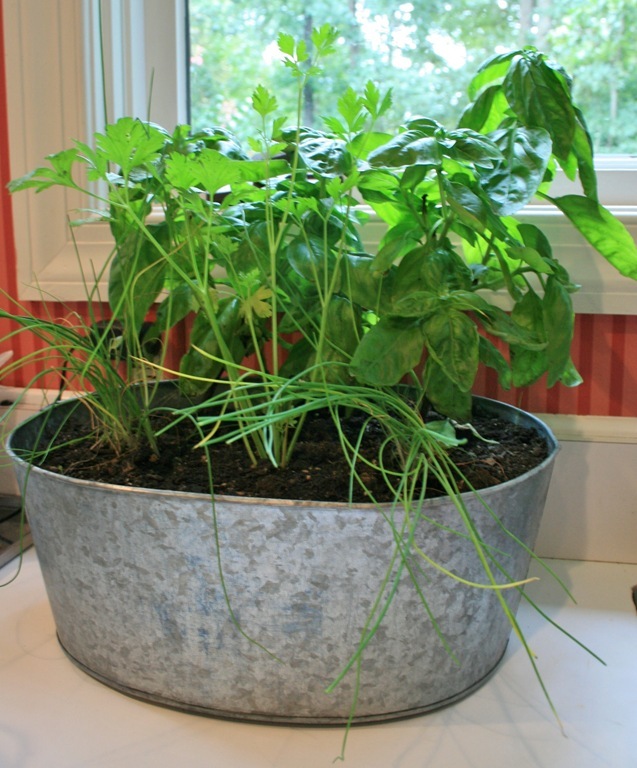 Last week I dug up a couple of basil plants, some clusters of chives and the lone parsley plant to bring indoors. 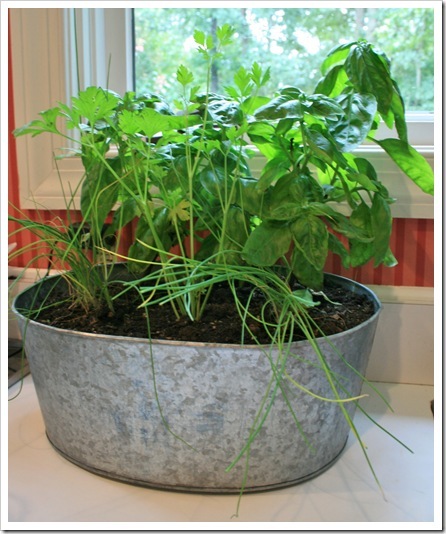 I used a cool oval galvanized tub that I found on sale at Joann’s the week before. 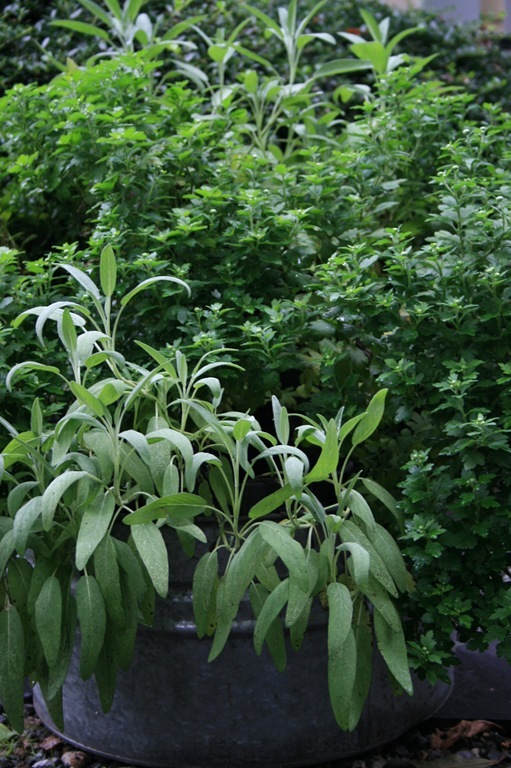 Now I am counting on the sunny kitchen windows to help keep these plants going, because I can’t wait to use fresh herbs during the dreary winter months. Also, for some fall decor I transplanted my extremely neglected mum plants from last fall into bigger pots, along with a couple of our overgrown sage plants from the garden. 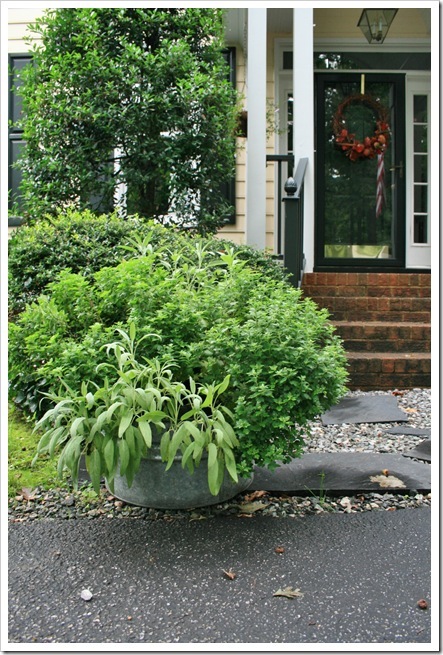 Since all I had to use for transplanting were ugly black plastic nursery planters, I squished them into our large galvanized tub to make one big display for our front landing. 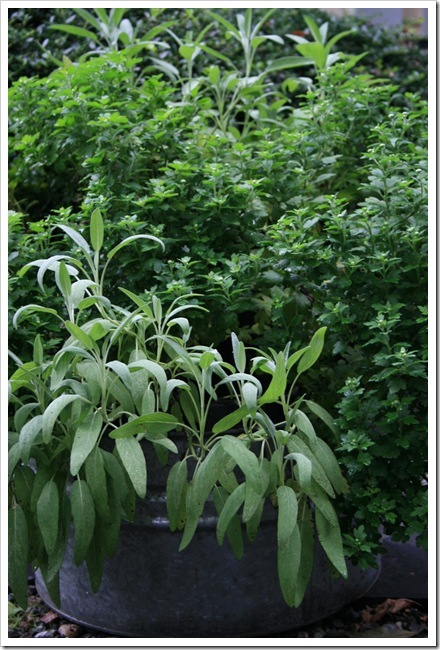 The soft gray-green of the sage plants contrasts nicely with the darker green of the mum leaves. I like the color of the sage plants so much that I am considering pulling the last couple from the garden to add to the pumpkin display we will place on the steps next month. 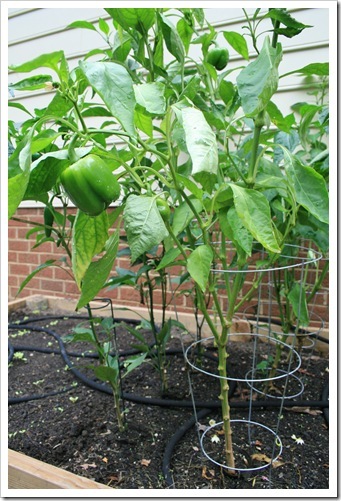 Plus, pulling them out of the garden will free up more room for spinach- yum! Now, if only the mums out front would give us some blooms we will really be in the fall décor business! Have any of you started decorating for this time of year? 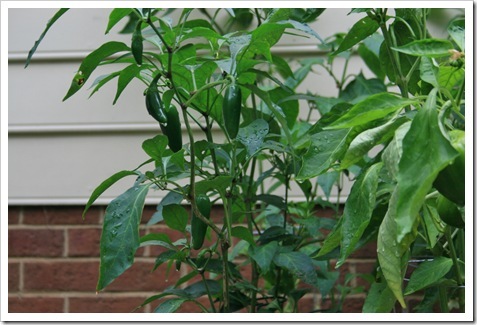 Do you bring anything in from your garden to keep going during the winter? Any tips to keeping things alive indoors? 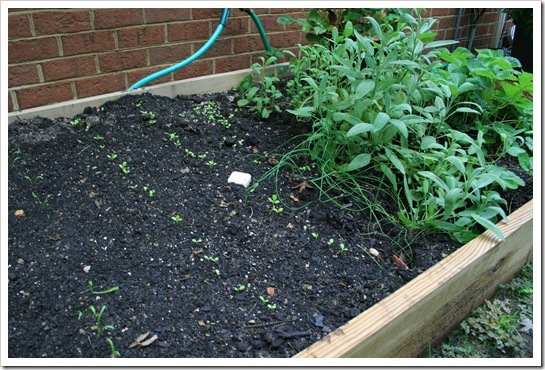 As you may recall, last year I mentioned that we planted a few veggies in an old planting bed behind our house and next to our back deck. It wasn’t a pretty sight at all, with rotting railroad ties and dirt spilling out the unfinished end toward the deck. You can jog your memory here and check out a super cute, rolly-polly fat baby helping me with the harvest while you are at it. This year I decided to get off my duff and make a slightly nicer raised bed to house our mini crops. Of course, as soon as I started discussing my plans with The Mister, he suggested I add another planting bed on the other side of our garage door. Initially I had been convinced that I could just plant other things in the sunny spots around the yard and harvest when ready. He reminded me of the deer that live in the woods to one side of our property, coupled with the plethora of chubby squirrels would result in nada if I didn’t keep my edible plantings near the house. He was right (don’t tell him I said that) because I have been losing strawberries to something that I’m guessing is a squirrel or rabbit just before they are ripe enough to pick. What’s funny about this dilemma is that the Little Guy and I will spot the ripening fruit and decide to give it one more day to sweeten up and the next day it’s gone! I am sure whichever animal is taking our goods is watching and listening to our every move when we are out back tending to our little veggie patch. Ok, back to the details. With calculating help from The Mister, I decided to build two boxes 4’ X 8’ with corner posts extending down about 6” into the ground. Basically we went to Home Depot and bought 6 - 12” X 8’ boards and cut two of them in half to create the short sides of the planters. Then we bought 2- 10 foot 4” X 4” posts to cut down for the corner pieces of the planters. Don’t double check the math too closely on this one. We messed up and ended up with more post wood than we needed. It didn’t help that I changed my original length to 18” posts instead of 24” as recommended by a DIY site I glanced before going to the store. All was well in the end because I used the leftover wood to help construct a new landing pad from our back garage door. I used our compound miter saw to cut the 4” X 4” posts down to 18” in length and to give them an angle on one end to help ease them into the ground. Then I simply laid my pieces out in the yard, forming a large rectangle, and used 1.75” deck nails to screw the whole thing together. Piece of cake. The hardest part for me was just moving the longer sides of the lumber around because they were super heavy. Then, once the frames were built I had to do a crazy shimmy, shimmy with them up on one end to get them in place. I know the neighbors had a good time watching me almost kill myself while trying to do all of this on my own. Once they were in place over the beds I had pre-dug, I just backfilled them and then added more soil to bring the level up to about two inches from the top of the side rails. I finished the raised beds two weeks before Easter and placed the last few plants the week following Easter weekend. Here are some shots of the progress at the beginning of June. A similar view to the before shots from the deck above. This new raised bed sits next to the deck and to the left of the garage door. You can see our leggy spinach and some pretty nice lettuce already coming in. I put sunflowers along half of the back and the other half of the back side is planted with green beans. Above you can see the carrots coming up, along with some sage. I put a “stepping” stone with my son’s handprint over the plumbing drain that could not be covered up. Now there is a nice, useable opening to the coiled hose between the deck steps and the planting area. Old bed plantings circa 2010. 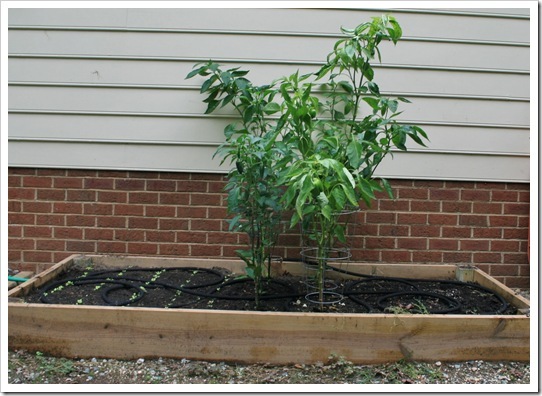 New bed plantings for 2011. As you can see the new beds are smaller. I wanted to keep the dirt pulled away from the brick foundation and make a little more space on the ends for walking around the bed. It’s still just big enough to be hard to reach the center, but with my height and long arms it’s still possible. Just on the other side of the garage door is the totally new bed. I moved the storage shed down the wall toward the driveway, creating a nice little pocket between the neighbor’s view and our garden, where we can hide our safety orange wheelbarrow (a $7.00 yard sale score, so the color mattered little.) The concrete pavers from our old garage door stoop were recycled as a stable, raised base for the new storage shed location, and so far the inside has remained pretty dirt free. Yeah! I planted some yellow squash along the left side of the back, just in front of a line of sunflowers that spans the entire length of this bed. On the very end of the bed I planted some cucumbers, with the idea that they would end up trailing out and around the edge of the bed, rather than across all the other plantings. The small plants in front of the squash and to the right of the cukes are basil and cilantro. 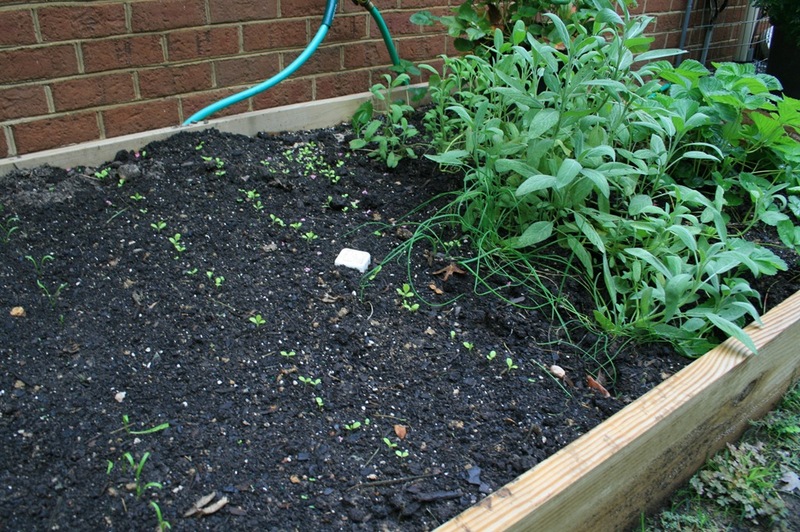 I intended to transplant the seedlings to the other bed once the spinach and lettuce had their fun. 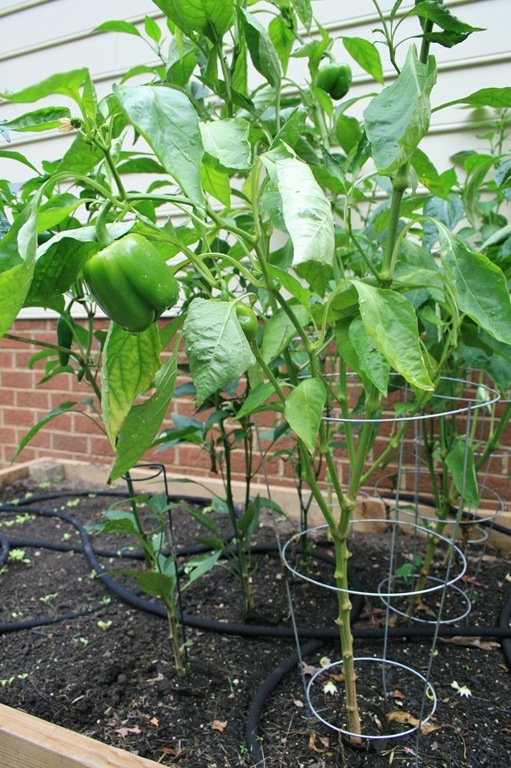 On the opposite end of this bed I have the tomatoes, green peppers and jalapenos. Sprinkled around the bottom are marigolds and some thyme runs along the front edge. The rickety looking metal fencing you see along portions of both beds are in place to keep the dog out. For some reason she thinks she needs to lay in the cool dirt of my freshly tilled garden, so I have to do ugly things to keep her out. I also learned that toddlers like to join their big sister dog in rolling in the dirt, so the fencing has served two purposes. One last share and I will wrap up this novel of a post. As you could see in the before shots way up at the top, the garage door stoop consisted of concrete pavers set in a rotting wooden box of sand. The pavers looked really bad and had been inching their way out of the wooden frame since we arrived at this home. Plus, the wonderful workers at Verizon were kind enough to run (through a flower bed, mind you) the wires for our cable and FIOS all of about 5 inches into the dirt and across our backyard. I was blow away in 2010 when I discovered them laying so close to the surface. I knew to be careful when digging, but I was sure they would be further down. Lucky for us, I did not slice through anything, but to save a headache in the future for us or other owners we decided to extend the back stoop into a spacious landing, and cover up those wires with something no one would likely be digging in to. I used 4” X 4”’s again to create a simple frame at 4’ X 7’ and rather than screwing them to each other, I drilled holes and pounded 12” long bolts through and into the ground at the board ends. This might not last for eternity, but it seems pretty stable for now. Then I added a couple more bags of sand and about 5 bags of gravel to level this area off and create a mud free zone. To make a little bit nicer path to the door I added large flagstone pieces, which also match the pathway from our driveway to the front steps. See! Some thought did go in to this! Anywho, eventually I would like to create some kind of panel to hinge across the utilities. You know, a door type thing that can be opened and closed in order to hide their ugliness. In the mean time I decided to position a trellised pot with snap peas in front of this messy part of the wall. 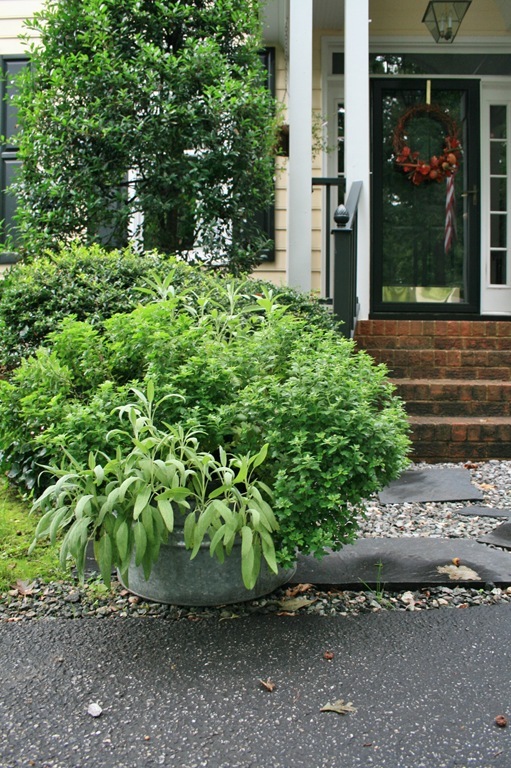 Plus, the pots add visual interest by the back door. It’s still a work in progress and I will share more photos the beginning of next month. But, I just wanted to let you all see how things are coming along so far back there this year. Pretty big change since we took over this little patch of Earth, eh?